BLOG | Ptermclean.com: Rothbury 2009: Where is the Line-up...? 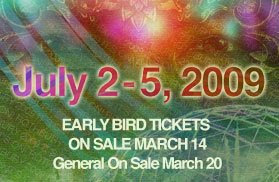 Rothbury 2009: Where is the Line-up...? Starting on Saturday, March 14th at 12:00 noon eastern time, ROTHBURY will offer a limited quantity of Early Bird Tickets. Early Bird tickets will be available while supplies last, or until the start of the general on sale on March 20th. The artist line-up for ROTHBURY will be released at a time following the Early Bird on sale, and prior to the general on sale. The Early Bird Ticket is a general admission ROTHBURY Weekend Ticket and includes a four day festival pass (Thursday through Sunday) and onsite camping/parking. The Early Bird Weekend Ticket Price is $229.50 (plus ticket fees). ...that's all well and great, but is ROTHBURY really banking on the fact that people will buy tickets before even seeing a line up? I for one, will. lol. it was such an amazing time last year that I would go in a heartbeat. Early ticket sales is mere five(5) days away. I really hope that they release an artist line-up this week, i cannot imagine that they won't. I was stumbling around the interwebs and found this cool flash player with a bunch of artist from last years show (click here). Nice job.